Courtney Fassett is a GeoDesign major and Spanish minor at the University of Southern California Dornsife Spatial Sciences Institute where she is a Presidential Scholar and a 2016/2017 recipient of the U.S. Geospatial Intelligence Foundation Scholarship. 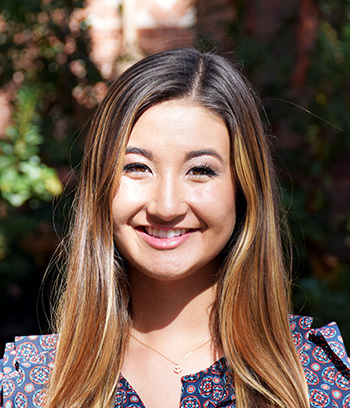 At USC, Courtney is a student researcher working on a team lead by Dr. John Wilson and Beau MacDonald that is using 3D visualization technology to map USC’s campus. Previously, Courtney served as an intern in the Finance, Strategy & Business Analytics Departments of VIZIO, a producer of the television and audio products maker. Courtney’s aptitude for visualizing solutions combined with a National Geographic exhibit titled “Women of Vision” and Professor Wilson’s 60-second Spatial Sciences Seminar sparked Courtney’s desire to study the application of geospatial solutions to economic challenges. Courtney is particularly interested in the application of geospatial solutions and data visualization to predicting consumer behavior. Having presented twice at the USC Spatial's Geospatial Summit while in high school, she is also passionate about advancing geography education for those considering a GeoDesign major in college. Upon graduating, Courtney is considering pursuing a master’s degree in GIS and a career in management consulting.